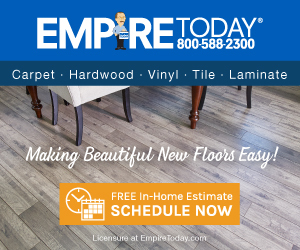 Empire Today - Awful sales person. Rude dumb whispering calling me nervous. I ordered an estimate from empire today. A sales rep came. He worked in Orlando and his name was Paul j. Older male shorter. From the beginning he was just strange rude and weird. He gave no sales presentation. He kept telling me I seemed nervous which was *** and made no sense. He kept asking me are you nervous?! U seem nervous. I continued saying no and what? He gave no sales presentation at all and whispered the entire time. Oh yes he was mumbling and whispering. When he got on the phone I heard him talk loud but then he whispered again. A sales rep whispering? I work in sales and u better believe I talk loud and concisely with energy and enthusiasm and I don't accuse people of being nervous. He continued telling me I was nervous and I ignored him. I was calculating prices on my phone and he said rudely who are you talking to?!! Again huh? wtf is he talking about. He said are u talking to your parents. Again why the heck is he even asking this and is it any of his business?! I said im calculating something. He was rude weird *** strange. As he was mumbling he said oops I'm mumbling again. Again wtf?! Just so crazy. Then as he was leaving again he accused me of being nervous. Usually when someone does that they're projecting how they feel onto the other person. I said well ur the one who seemed nervous. Then he said he was only nervous because I was. Again a big huh?! Then he said rudely. Look at the distance between us as if my standing a few feet behind him was abnormal and indicated nervousness. His behavior was ludicrous and bizarre. Definitely not one of a normal person or sales rep. He wasn't trying to sell me anything just basically put me down and be rude and weird any chance he could. Just a bad weird experience. Empire was nice and rescheduled but really wtf was that about. Review #546842 is a subjective opinion of User546842.